Hanging blister card. Each light holds 3 super bright LED bulbs which simply push on/off. 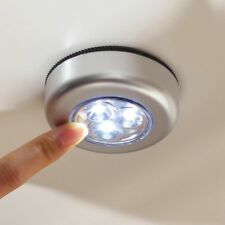 These battery operatedLED Push Lights have a self-adhesive back to connect to a range of surfaces. 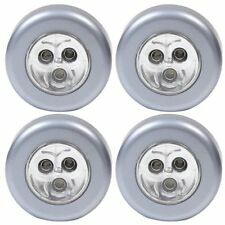 The lights are ideal for under shelf lighting, use in lofts, sheds, cupboards, cars and kitchens. Great for a kids bedroom, this cool push lamp features a large image of Marshall, Skye & Chase. Great way to help your children get off to sleep at night. 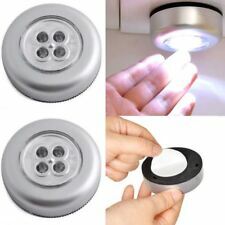 These night lights can be easily mounted to a wall or placed flat. The light stays cool to touch while it sends out a soft glow to help your little one drift off to sleep. A cool PJ Masks LED night light and projector. Kids Bedroom. Uses LED warm white light to provide a cosy atmosphere. STAR WARS OFFICIAL, NIGHT TABLE LAMP. 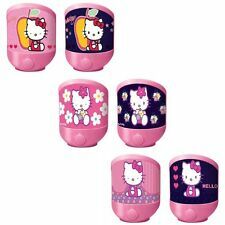 PUSH BUTTON TO TURN ON OR OFF, battery OPERATED, 3 x AA 1.5v (NOT IN LAMP) SAFE FOR CHILDREN'S LITTLE FINGERS, COOL TO TOUCH & CORDLESS. MAKES YOUR CHILDREN'S ROOM A STAR WARS ZONE. Gro Friends Ollie the Owl Sleeping Aid. Cuddly light up teddy bear. Squeeze this teddy's paw and his face and belly will start to glow, slowly shifting between blue, green, red and purple. Press his paw and look at him glow. Glows in a range of changing, relaxing colours. 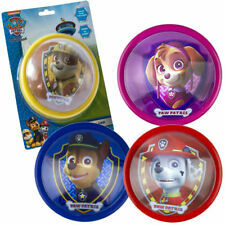 DISNEY BATTERY PUSH LIGHT BY DECOFUN RRP £12.99. THIS NIGHT LIGHT RADIATES WARM AND SOFT LIGHT. You are now bidding on a great led lit Star Wars earth vador wall lamp It comes with 2 batteries You have 2 modes Fully lit as per the picture Darty Vador eyes only for the scary dark side effect. Used but looks as new. https://www.diy.com/departments/darth-vader-3d-black-wall-light/1697711_BQ.prd?utm_source=google_cpc&utm_medium=shopping&utm_campaign=PX_GSC_Décor_ _Generic&ppc_type=shopping&ds_kids=92700029894459442&gclid=CjwKCAjwvbLkBRBbEiwAChbckbL95T_gY7p0WfVPW_IuOpjXUkRZpmChaFDbzUbRYnCDc321YUZsEhoCnSwQAvD_BwE&gclsrc=aw.ds Any questions let me know. May the force be with you. Squeeze this white teddy's paw and his face and belly will start to glow, slowly shifting between colours including blue, green, red, yellow,white and pink. Super soft teddy bear with light-up cheeks and tummy. Picture changes when light is turned on. Chicco First Dreams Lullaby Musical Sheep. Lullaby Sheep. Lullaby Sheep x 1, Instructions x 1. Soft little lamb with gentle night lights. Push button to turn on and off. Battery Operated. WINNIE THE POOH, TIGGER AND PIGLET. ROYAL DOUTLTON WINNIE THE POOH MUG cDISNEY. CLASSIC POOH BORDER FINE ARTS. DISNEY POOH SOFT TOY, OPENS AT THE BACK, GOES UP TO THE HEAD. BEEN SITTING ON SHELF, SMALL CRACK INSIDE MIDDLE, SO FOR DISPLAY RATHER THAN FOR USING. Paw patrol push lamp. Brand new in box. We understand that what matters most to parents is keeping their children healthy, happy, and safe. Tomy Lamaze Night Night Owl. Requires 3 x AAA batteries. Select between lights only or lights and sounds. Disney Finding Dory Childrens Soft Lites Night Light. Condition is New. Dispatched with Royal Mail Signed For® 2nd Class. 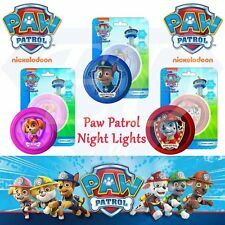 Boys Girls Paw Patrol LED Push Light Kids Character Bedroom Nightlight Lamp Gift. Condition is New. Dispatched with Other Courier (3 to 5 days). SYNDERAY NIGHT LIGHT OCEAN WAVE LIGHT PROJECTOR WITH BULIT-IN SPEAKER. It is also perfect for creating a watery ocean atmosphere, which can be used in bathrooms, living rooms, or any other area. Creates a perfect ocean wave atmosphere for sexing,relaxing and sleeping. This multi-function Projector Night Light is perfect for PJ Masks fans. It works as a reassuring bedside light and can also be used to project colourful scenes onto walls or ceilings. Portable and easy to grip, this fun LED light is also safe and cool to touch. LED Push Lights. - Easy Stick With Self Adhesive Pad. - 3 LEDs Per Lights. - Push On / Off. Calming star and moon display. The light stays cool to touch while it sends out a soft glow to help your little one drift off to sleep. A cool PJ Masks LED night light and projector. Uses LED warm white light to provide a cosy atmosphere.